On May 3rd, 2011, a group of explorers, Marc Laukien, Jill Heinerth, Capt. Ian Burry and Brian Kakuk departed from Florida on the M/V Deep Sea Nine, a 60 foot trawler, and headed east to the beautiful islands of the Bahamas. Our objective was to explore a series of potentially unexplored blue holes that I found on GoogleEarth. Armed with GPS coordinates and screen captures, we worked our way through the central Bahamas, from Nassau, to the Exuma Cays where we stopped for several days to wait out weather and to do some awesome cave diving in the marine blue holes of Elizabeth Harbor. After three days of diving we pulled up anchor and continued south past Long Island and into the Bight of Acklins. 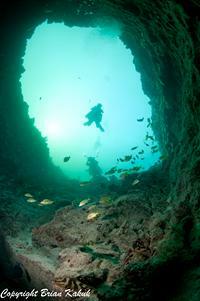 This remote and extremely shallow bay holds amazing blue holes that very few have ever entered. Our targets were in the extreme eastern part of Mason's Bay near the settlement of Snug Corner. As it turned out, 6 of the 9 targets we plotted turned out to be massive underwater canyons, with strong currents, tons of marine life and more virgin cave than we could ever have expected. The images below were taken by team members Jill Heinerth and Brian Kakuk. A more detailed account of the expedition will be presented here in two weeks. At 12 I came on and took the helm. The seas were flat calm as we slowly cruised Marc�s Kadey-Krogen 58, the M/V Deep Se Nine, along the eastern shore of Long Island. Around 2 AM, the radar showed a large cargo vessel passing across our bow and heading north. The AIS (automatic identification system) showed the vessel to be the M/V Aisling, headed to Norfolk. The Mini Automatic Radar Plotting Aid (MARPA) showed it passing across our bow at 2.5 miles ahead of us, so I could relax and not worry about having to change course. The depth sounder showed steep canyon walls rising up from thousands of feet, and reaching up to less than 100 feet under our keel while we passed Clarence Town. I imagined the amazing underwater wall below as the depth sounder then plummeted into the abyss once again on the other side of the narrow peninsula below us. I thought about how lucky I was to live in a time of such incredible technology, and of the thousands of ocean going men and women who had passed this way before me without the digital screens and sensors I now used to keep track of my environment. They used the stars, the currents, sounding lines and years of experience on the sea to keep them safe and on track�.. but all too often these were not enough to keep them off of the thousands of reefs surrounding these amazing islands. I felt extremely lucky tonight. The lights from Clarence Town slowly passed to our right as we cleared the southern end of Long Island and headed across the ten thousand foot deep Crooked Island passage. Marc Laukien, our expedition leader and owner of Deep Sea Nine took the helm at 3 AM and it took me less than a minute to fall asleep once my head hit the pillow in the bunk. When I woke in the morning, I climbed to the fly bridge where Jill, Marc and Ian were all looking into the morning sun as we glided along glassy, shallow waters just off the northern shore of Long Cay, Crooked Island. The water was air clear and so calm that you could not see where the morning horizon ended and the sea began. It appeared as small islands were floating in the hazy sky off to the right and left and we all commented on how lucky we were to have such fantastic weather for crossing the shallow Bight of Acklins. Nurse sharks, sea stars and sponges were the only creatures we saw in the shallow seas beneath Deep Sea Nine. Eventually we turned away from Long Cay and headed southeast across the Bight of Acklins toward our anchorage at Spring Point, Acklins Island. <?xml:namespace prefix = o ns = "urn:schemas-microsoft-com:office:office" />Around noon, we dropped anchor in 8 feet of water, off an old, decrepit and barely standing dock at Spring Point. Once the anchor was set, it wasn�t long before we were all aboard Marc�s 26 foot Glacier Bay catamaran, the Escape, and heading toward a series of potential blue hole targets that I had found using various means, the most productive being GOOGLE EARTH. After Marc and Jill snorkeled several deep blue pits at spring point, we headed further into the bight of Acklins and headed east to a series of extremely large, but undetermined targets near Snug Corner, the most eastern settlement of Acklins Island. The first few targets turned out to be shallow coral heads as we slowly crept into shallower and shallower water to the east. Eventually we could see some very dark marks in the sand up ahead. We followed the GPS coordinates across the shallow bar to the first dark area. As we approached, ooohs and aaaahs were uttered all around. A massive 100 foot long crack in the shallow sea bed plunged down into crystal blue abyssal depths which then faded to black unknown depths below. The walls of the incredible fissure were sculpted into many horizontal ledges giving the opening a canyon-like appearance. Marc and Jill leapt over the side and snorkeled over to the first opening. Marc could be heard off in the distance loudly shouting through his snorkel, �Oh Wow!�. He looked back at the boat and shook both fists in victory. We had found what we came to find. The two divers climbed aboard and we repeated the evolution 5 more times in a series of massive, rifts heading almost north and south across the shallow bight of Acklins. Late in the afternoon, we turned the Escape back toward Deep Sea Nine anchored ten miles away. On the trip back we all talked about the potential for virgin cave and our impressions of the massive rifts. With the approval of the others, I dubbed the area, the Blue Canyons and the Blue Canyons Expedition was born. After a not-so-early departure from DEEP SEA NINE, we sped across a slightly choppy sea toward the Blue Canyons, Capt. Ian Burry following yesterday�s track toward yesterday�s new discoveries. 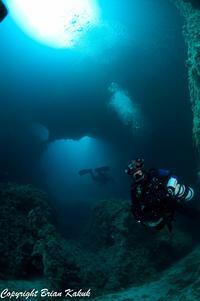 We arrived in short order and the anchor was lowered to a shallow ledge just inside one of the larger canyons. We couldn�t get the tanks over the side fast enough as each of us readied our dive and camera equipment for what we hoped would be amazing discoveries. The water was a warm 81 degrees and a little more green than yesterday, as we wrestled on our side mounted cylinders and grabbed our cameras. At 20 feet, Marc tied off the first reel of the expedition and we all clipped off our oxygen cylinders. Marc lead the way into the northern most end of the fracture. Grunts and jacks bolted out of the way as we dropped into a sculpted solution tube that descended to a rubble floor. We were surprised to see that the floor led off into a series of round, sponge and algae covered passages at a much shallower than anticipated depth of only 75 feet. Once we hit the floor it became obvious that the tide was siphoning into the passage, but not with incredible strength. We went in about 200 feet or so before I decided that the current was picking up too much for a siphon and I signaled that we had gone far enough for the siphoning tide. Marc and Jill agreed and we began heading back to the entrance. Once back into daylight, we decided to check out one of the other large round openings in the bottom of the main shaft, this time, the middle shaft, but on the southern end. Once again Marc tied off and headed in with Jill and I close behind. Unfortunately this passage was also siphoning but not nearly as strongly as the first. We glided along slowly as the current drew us further into the rounded and sponge covered passages. Marc concentrated on tie offs, of which there were few, while I tried to find what seemed like the most obvious way on and Jill surveyed in behind us. Eventually Marc came to the end of his reel and he made the final tie off. Marc placed an arrow on the end of the line and left a courtesy loop in the end for the next diver to tie into on some other dive. We called the dive and I decided to practice my survey skills as well and surveyed out so Jill and I could compare notes back on the surface. The cave is literally a labyrinth. There were passages heading off in many directions, and none of them seemed to loop back into each other. Back in the daylight zone I tied off another reel and decided to check out yet another passage. Like the others, this too was siphoning slightly but headed off in a completely different direction. After 300 feet or so, I decided this was enough for the morning session and I reeled everything back out. We met Jill back at our decompression stops as she hovered above us shooting video of our amazing surroundings. As I rose past the anchor, and swam back to the boat, I thought to myself, that this is going to be an exciting week! We raced back to Deep Sea Nine which was 10 miles west of the giant rifts for a quick lunch and to refill our cylinders. A few hours later and we were once again anchored over another one of the blue canyon targets. As we swam toward the bottom of the canyon, the far end of the fissure slowly came into focus through the 50 foot visibility. Huge multiple arches with light beaming through each one, bowed over a large cave entrance. I tried to photograph the amazing scene, but the water was a bit too murky to do the subject justice. We swam through the arches, tied off the guideline on a large boulder and nervously allowed the siphoning tide to draw us in. This time the passage stayed large and A-framed, maybe 25 feet wide and the same high in the center. The walls and ceiling of the cave were completely covered in 1-foot-thick, multicolored sponges. It was almost as if we were sailing through a psychedelic, rubber-sided room. The line ran out after less than 400 feet and I tied off in the growing siphon. Jill soon caught up with the survey slate and after her last station, we began our crawling and kicking against the current and back toward the entrance. Once back in the daylight zone we each tried desperately to catch the amazing arches on video and still images. Once we are able to dive these sites on the clearer, outgoing tidal cycle I think we will nail the images we are looking for. Smooth, glassy seas allowed us to slowly move the Deep Sea Nine closer to our primary targets of the Blue Canyons system this morning. We anchored at our new site by 10 AM and loaded the Escape by 11AM. We tossed the anchor over the side into Blue Canyon #3, aka Crawfish Canyon. The first passage we chose pinched down only after 100 feet or so. We then swam to the opposite end of the cave and headed in to the North. Line laid- 427 feet (Jills reel and Marc�s Reel). 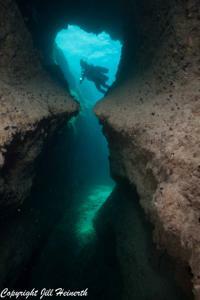 This morning, I swam into the north passage (1 of 7 entrances) in this huge fracture we called Snug Corner Blue Hole. Once again the tide was siphoning strongly and it was very intimidating being siphoned into the cave. There were scattered parts of a long lost wooden boat strewn across the bottom near the entrance, as well as bottles from past and present times mixed in with conch shells and sponges. About 100 feet into the entrance I came across a small lobster hiding under a sponge. As a joke, I snatched up the lobster and tied two quick loops onto it with the guideline as sort of a wandering, mobile tie- off point and hopefully Jill would find it amusing when she found it as she surveyed in behind us. We continued on into the sponge-covered passage until we laid all of the line from Marc and Jill�s reels. I waited for Jill to finish surveying the end of the line and then we swam out together. Once back at the entrance Jill began taking photos and Marc and I swam to the southern end of the canyon to look for more entrances. We found there were at least 7 cave entrances, some of which simply loop back into other passages, but there is a LOT of cave here left to explore. For the afternoon dive, we arrived back just as the tide changed and we FINALLY hit the slack and out-going tide. Marc and Jill headed over to the southern entrance while I checked out the western entrance right next to the northern entrance. When I got inside and saw the slack tide, I swam as fast as I could to try and take advantage of the still water. The passage headed south west at first and then eventually moved more west. The passage was very wide and I had to use the remaining slight inflow of water to show me where to go. I glided through what I hoped was the main tunnel, with lobsters and crabs crawling out and about while the current was down. Eventually the current changed over and a very slight outflow was coming at me. About two hundred feet into the cave, the tunnel began to get smaller and smaller, sometimes becoming a very low bedding plain and then changing once again back into a round, scoured, solutional passage. More convenient tie offs allowed for a faster pace and eventually I found myself in an area so low that it didn�t seem like it would open up again. I slowly turned around in the low bedding plane and made my final tie off. I tried to get the GOpro helmet camera to show the tie off and survey process on the way out. Eventually as I got closer to the entrance, I saw Marc and Jill poking around off in the side passages. I wanted to come out of the water with an empty reel, so after I finished the survey back to the entrance, I headed back in and looked for a side lead heading south. Eventually I found a decent one with good water flow and put the remaining 60 feet of line off the reel and surveyed it back out to the main line. Deco was almost 40 minutes, but it was well worth the time in the cave. We went to check out Blue Canyons #4 today. The tide was siphoning so strongly that there was a bit of salt foam swirling on the surface. Dive aborted. Marc, Jill and myself tried getting into the very pretty, but highly tidal blue hole. We tried 3 different openings, but each was too small and didn�t go very far. There were tons of fish and the water was distorted due to thermocline. We quickly bailed out and went to another site. The entrance to this fantastic site is a huge coral rimmed dropped to a depth of 53 feet, with no less than 3 passages leading off into black. A few large rocks laid in the bottom and were lit by the afternoon sun, creating a sort of Coliseum or amphitheater look to the entrance. A perfectly calm morning and we glided over the shallows to the Atlantean Arches canyon. Marc and Jill headed in together to lay line in the western side of the cave while, while I, after a rough start (forgot my primary light on the boat), found a good sized opening heading off to the North that we had not checked out yet. The current was once again siphoning fairly well, but not enough to call the dive. The floor of the cave was a mix of course sand, sponge, rock and the occasional lobster. After several small rifts and some side mount restrictions, the low wide passage began to break up into several smaller passages, all heading the same direction. I tied the line off on a small floor pendant in a very small, sandy and scoured bedding plane where I had just enough horizontal room to turn around and began surveying out. The siphoning current gave me great visibility for surveying and I ended up with 703 feet of new line put into the cave. On the way out, the closer I got to the entrance, the slower I swam, trying to maximize my time in the cave and taking in all of the amazing sights the cave had to offer. Once back at the entrance, I picked up my camera and spent my decompression time taking photos in the arch gallery and up at the shallow coral heads surrounding the upper ledges of the blue hole. The caves here in the Bight of Acklins have literally surprised us with seemingly perpetual passages filled with life and stunning geologic formations of the most massive arches any of us has ever seen. Acklins cave divers dream of more virgin cave than we could explore during this (or probably several) expeditions. The area with its seemingly unpredictable siphoning currents is for more advanced explorers, but for those who are willing to put the effort and funds into exploring here as expedition leader Marc Laukien has done, the rewards are great.